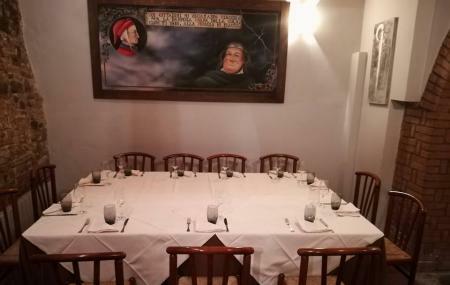 Located in the heart of the city of Bologna, Ristorante Ciacco will surprise by its combination of unique ambience and tasty food. The restaurant is built inside a wine cellar of a 18 th century palace and the characteristics of Jewish ghetto houses can be felt even today. The restaurant’s philosophy is “Tradition and creativity, territory and new trends marry to create delicious dishes of land and sea, always respecting the seasonality of the raw materials used.” Here, the menu keeps rotating, making use of the freshest ingredients and chefs are more than happy to take your requests. The wine list here is endless, with more than 400 labels available to choose from. The staff here is very friendly and you will have a gala time here trying out the various pasta dishes that the restaurant has to offer. Top attractions of Bologna worth your visit include Piazza Maggiore, The Two Towers, Piazza Santo Stefano, Fontana Del Nettuno and Basilica Di San Petronio. Visit these and also discover other interesting things to do in Bologna before planning. Find the joy in planning a D.I.Y. trip by using this awesome Bologna trip planner. You won't miss your home when in Bologna, hotels in Bologna like Hotel Roma, Albergo Delle Drapperie and Hotel Touring offer some of the best places to stay in the city. Explore the best Bologna vacation packages that will take to you important landmarks of the city! For getting in, check out how to reach Bologna. Other recommend time of arrival: 12:30 PM to 01:30 PM. How popular is Ristorante Ciacco? People normally club together Il Panino and Ristorante Diana while planning their visit to Ristorante Ciacco. Good, but not great. Some items are hit and miss like that angel hair pasta with spinach Which was too bitter. But they listened to the feedback and didn't charge us for it. Nice service. Fantastic food, wonderful service, lovely staff. Wow! Foods are really delicious! Little But cosy restaurant. Friendly waiter for welcome. Lovely and typically Bolognese dish I had ... reason to come back. Nice wine card and Great chose of desserts. Really fine kitchen . Finding parkingplace is not that easy. Excellent food, very friendly owner, lovely wines. We had the menu degustatione mare (seafood). Could not fault it.